Video gaming chairs, what are they, should you get one, and most importantly, is it worth the investment? These are questions you may be asking yourself and the answers deppend on a variety of factors such as, how important is the gaming experience for you or whom you are intending to purchase for? Where will it be placed and how will it be used? Will it be a permanent functional seating option or will you need to store it while not it use? How much does one cost? 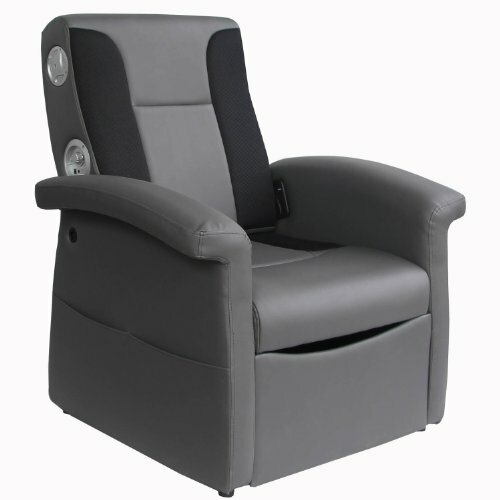 Gaming chairs come in a variety of fabrics ranging from vinyl to leather. They offer different styles; some sit directly on the floor, others rock or are on sliders or are built on pedestals. One thing that all gaming chairs have in common is comfort. They are built to prevent back aches, leg pains, and ensure a perfect place to endure a long gaming experience, that can sometimes last for hours. They offer a variety of features, ranging from a built in sound system, complete with a vibration system made to bring the gamer deeper into the experience of the game. Pockets to store controllers and remotes, cup holders, extra storage and some offer peddles and a steering wheel for racing games. Are you, or the person for which the gaming chair is intended, a serious gamer? Do you spend hours playing games in which you need a comfortable seating option that will prevent back and leg pains? Will having something that will bring you closer to a real experience through vibrations, and having the sound quality clear enough to hear all the little tones the game developers intended you to hear amplify the enjoyment you receive through gaming? A deciding factor may be, where will you place your gaming chair? For instance, will it be placed in a teenagers room where it will be used for a variety of purposes, perhaps homework in addition to gaming? If this is the case, you may choose to get a gaming chair that sits on a pedestal which can dual function as a computer chair. Do you have a designated gaming or media room where gaming and watching movies is the sole purpose of the space? In this case you may choose to go for a bigger design, maybe one that has cup holders and looks more like theatre seating which will add ambiance to a media room. Or perhaps you will only be using it on occasion or have limited space. If so, you may need the ability to store the gaming chair easily when not in use? The designs are endless, and should be considered when planning your purchase. The price range varies from $30 up to over $1000. The price depends greatly on the features added over the quality. A higher price tag generally means greater sound quality, more control functions, as well as little luxuries such as cup holders, storage compartments and so on. In some cases you will get a higher quality chair, but this is usually in the form of fabrics used to make the chair. With a cheaper one you will most likely get a chair made of vinyl or cotton, with not as many speakers and in some cases, no speakers at all and no added features. However, comfortability won't be sacrificed with a lower price, as these chairs are all built first for comfort. Bean bags can be extremely comfortable, but don't offer the support you need to endure long periods of time in the same position. Couches, armshairs, etc. have more support, but again, don't provide the shape and structure made for long durations of sitting. You also lose the built in features that allow the experience of gaming or watching movies to be magnified to higher levels. With a gaming chair you get comfort, design, and the ability to highten your experience of pleasure you receive through any media experience. All-in-all a gaming chair is well worth the purchase. Great permanent seating option for a media or gaming room, comfortable chair with storage and sleek theatre look. 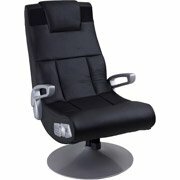 Perfect gaming chair that can have function as a desk chair as well for a teenagers room or where space is limited.